Old habits die hard, don't you think so? Even our cooking habits embossed and embedded in us by. Who else will drill cooking in our head, but our grandmothers and mothers? Girls must learn to cook their philosophy. Yes. Trust me. If you don't start cooking as young as you are, simultaneously you don't pick up the cooking tips from them, all hell would have broken loose those days. Sometimes they themselves can be the hell monsters. Literally pushing you, no matter what, you must cook. I know. I didn't have it all easier either. Knocks on the head and being pinched. Duh! Perhaps maybe, for the better? I really don't know what to say. Regardless, this habit of whenever its a crab dish at home (Malaysian Chilli Crab & Crab Curry), it must be in tandem with the claws or legs kept for Nandu Rasam until I am still till this day doing the same and of course, no complains from my Indian other half-half. And so, the story goes as well for this another version compared to the previous (Indian Crab Soup). Indian Pepper Soup (Mor Rasam) and crab legs in one. A tweeted and modernised version because I used store bought spice powder and of course, as usual, how can our Indian soup be perfected without turmeric powder (Turmeric Tomato Soup) and for Nandu Rasam, pepper is quintessential (Mixed Vegetable Soup). 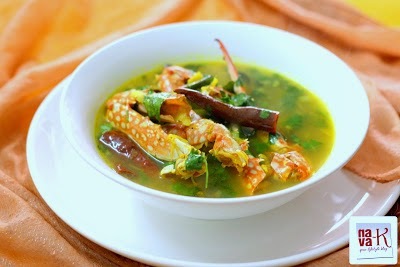 Nandu Rasam (Crab Legs Pepper Soup). Go ahead slurp in or like us Indian, banjir/flooded over rice. When oil is heated, saute shallots, ginger and garlic for about 2-3 mins. Add spices and crab legs. Stir together until legs becomes slightly reddish. Add dried chilies and curry leaves. Stir again and pour 1/2 liter of water. Stir in coriander leaves and remove from heat. looks very aromatic & spicy soup.. I can not say anything about the taste of crabs in soup because I have never tried. But I do agree with you about the flu fact and it does work. This has so much wow factor with the crab legs, and I can practically smell the flavor wafting through my computer! 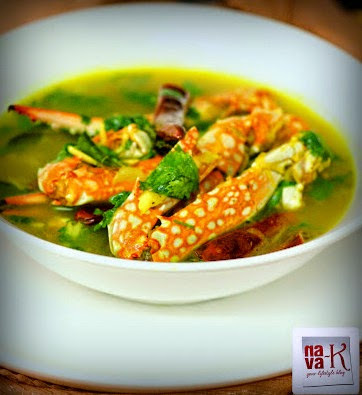 Oh, Nava, I am soo going to make this, even though fresh crabs are so hard to find here! Ha! We're actually going crab fishing this week with the kids, maybe this time I'll bring some back instead of throwing them all back! Thanks for this recipe, I make rasam but have never put any seafood or meat in it, will let you know how much I loved it, because I'm sure I'm going to! Hi everyone, worth cooking this dish was for me as i found this wonderful post while my eyes were roaming around the internet for what it was I would be cooking for the family. It just so happened that in my fridge contained all the ingredients to make this tasty zesty dish and for sure for my family crabs are highly populkar. It goes without saying that the whole family was in high notes when they found out that I would be trying this recipe out for dinner. I could almost hear their hunger juices bubbling away to the tune of the bubbling soup. As soon as this dish settled on the table my nephews were sipped into the spicy soup without even bothering about the other dishes. They almost jumped with satisfaction at the spicy peppery taste but also not to forget the slightly sourish tangy flavours that were infused into the dish thanks to Nava's recipe. She is definitely a great one when it comes to Malaysian/indian style cooking i must say. Thanks Nava for taking my taste buds on another culinary venture. This is SPARTA!!! Nava, I am so making this the next time I get some good Alaskan crab legs--it looks delish! This looks amazing.... the colors of the soup are so vibrant. I would want this if I had the flu. A beautiful appetiser my friend with flavour, presentation and lovely ingredients! i love a good hot bowl of rasam. does wonders to the tummy. always thought it was lots of work until you shared. thanx!!! Mmmm. That looks so delicious! wanna try that someday. This is a new one on me but looks and sounds fab. Such a great colour! oh crab soup is something new for me to try on :) yummy! You are an amazing cook! After a painful visit to the dentist, all I can have is soup for the next 10 days, I would love a bowl of your pepper crab rasam!